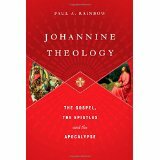 What do I think of Paul Rainbow’s book on the theology of John? Let’s talk about it on Deeper Waters. Rainbow begins with a brief history on Johannine studies and with a defense of authorship and the date of the writing and such and from there, it’s off to see what the book has to say. The opening should be sufficient for those who are interested in the basic apologetic aspect to understand the usage of John in studies of the historical Jesus. Rainbow argues that while John’s Gospel certainly tells us about the life of Jesus, the main character being it all is really God. The Gospel should be read not just as a Christological statement but as a Theological one. This is fitting since we are told that it is the Son who is explaining the Father. We know God by knowing the Son. He who has seen the Son has seen the Father. We cannot know God as He truly is apart from knowing the Son and the Son came to reveal the Father. I found this to be a highly important insight. Rainbow is not at all downplaying the importance of Christology. He has plenty to say about that in a later chapter and of course, he comes down on the side of orthodox theology, but he does want to stress that we cannot leave God the Father out of the equation in John. I will say when he got to Christology, I was disappointed on one aspect. Much of the Christology came from the Gospel. I find an excellent place to go to really to get Christology in the Johannine corpus is to go to the book of Revelation. I did not see this interacted with in the work. Revelation begins after all describing itself as the Revelation of Jesus Christ and it does say that the testimony of Jesus is the spirit of prophecy. Rainbow also covers other themes related to theology. He covers the question of salvation and that of apostasy. He covers issues related to free will and predestination and points out that John has no desire to really address our questions there. It could be argued that John in fact argues for both sides of the equation. He also argues for how John says the church is to be to the world. Surprisingly, there is little on eschatology and this was one area I did have a difficult time with as I happen to highly enjoy discussions of eschatology. Rainbow does take a futurist stance in his writings and that is not something that is argued for. I find it interesting for instance that Revelation is said to tell us about the antichrist and yet Revelation never once uses the term. Still, Johannine Theology is a difficult topic to handle and I think Rainbow for the most part does an excellent job. I would have liked to have seen more on eschatology, but then that could be its own book entirely. Still, if you want to understand the writings of John in relation to theology, then you should get yourself a copy of this volume. What do I think about Mark Noll’s book? Let’s talk about it on Deeper Waters. The Civil War was an awful time in our nation’s history. There can be much debate about what went into it and why it happened. I personally don’t think the war was about slavery at the root, but I think slavery did play a part in it. I would say it was about the decision of the states to secede the union. It did end in freedom for the slaves and the abolition of slavery, but there was more to it than that. Still, that’s just a theory and I leave it to Civil War historians to say more about that. There can be no doubt however that slavery is a dark mark on our nation’s history as well. What is even sadder about it is that so many people were using the Bible to defend the practice. This has led many of us to forget that the Civil War was not just a crisis of politics, but in fact it was a crisis about theology, since both sides would be able to say the exact same statements about the Bible. They’d just disagree on hermeneutics. Knowing my interest in inerrancy, it was suggested to me that I should read this book. I’m glad I did. I found in it many of the problems that are still going on today. Here in America, we believe greatly in the individual power of each person. To some extent, this is not problematic. However, the problem is we often carry this over to every area. We say that the average man is capable of electing his leaders for government. (Note that unique aspect of us. We are a self-governing people instead of people who have a king ruling over us.) We believe in the American Dream where with hard work and ability, you can reach the goals you have. You are to have the freedom to pursue happiness. If all of this is true, then surely we can also do what every other man should surely be able to do! We can read the Bible and interpret it correctly! This is especially so since if this is the Word of God, then it must be that information which God would want us to know and if He wants us to know it, it should be simply to understand shouldn’t it? Now I do think the common man to an extent can understand the Bible. You can get the main message of the Bible, such as that of salvation found in Jesus Christ, out of the Bible by a casual reading. Yet you will not get the inner intricacies of the Bible without doing real deep study and it could be the “common sense” interpretation, might be what many Americans think it is, but not what it really is. Of course, the fact that we were materialist did not help with this. By materialist, I do not mean philosophical materialism, but rather that we had a great love for our wealth. Slavery was a great way to increase your wealth. Invest a little bit in some slaves who you don’t have to particularly treat well and have them do all the work for you. Still, we’re going to be sticking with the problem of Scripture. America had been largely built on the Bible and it held a high place in American society. So what happens when there is a fundamental disagreement among the common man on how it is to interpret the most important book that exists in the American culture? And you thought your church scuffle was bad…. The great danger is that so many Protestants were saying the Bible was clear on the issue. Unfortunately, that clarity existed on both sides. One side said the Bible was clearly pro-slavery. One side says the Bible was clearly anti-slavery. Once again, we have the same problem today with people going by what is “clear.” What is clear to a modern American however is not necessarily what would be clear to an ancient Jew. Also add in the view of providence and this makes it more difficult. Every event was interpreted as a specific “sign” from God. (I always get wary when people talk about receiving what they are sure has to be signs from God. These are even more difficult to interpret and while God allows all things to happen, there is no clear indication that any one of them is a direct message from God to the people involved.) This could in fact be something that’s a precursor to another situation today in America, interpreting events in the Middle East as signs from God and seeing Scriptural fulfillment in everything that happens. A lot of this also came from Christianity blending itself with the Enlightenment. If the power of reason by its own is so great, then surely we can understand a book like Scripture and it must be simple. After all, if God is going to speak a message, won’t He make that message simple? Note that this is an assumption that is not defended. If anything, reading the Bible should show that the message will not be simple as even Jesus says this specifically about His parables. But because those arguments did not feature intuition, republican instinct, and common sense readings of individual texts, they were much less effective in a public arena that had been so strongly shaped by intuitive, republican, and commonsensical intellectual principles. In fact, notice this contrast shown in Location 612. James M. Pendleton was a hard-nosed defender of the Bible’s inerrancy as well as of Baptist distinctives, but that cast of mind did not prevent him from mounting a strong case against slavery as practiced in Kentucky at a time when possible legislation concerning slavery was being considered by a state constitutional convention. What this gets down to was that too often, an attack on slavery was seen by those with the persuasion that the text was simple and clear, that this was an attack on Scripture itself and an undermining of its authority. After all, if this is what Scripture clearly teaches, then if you are going against it and bringing in ideas outside of the text, then you are going against the text of Scripture and undermining it as the final authority. As Noll regularly points out, this was an American problem. It wasn’t that much of a problem to those who were outside of America. In America, to go against this viewpoint would make you be seen as heterodox. In the other nations, it would not. The problem then was not the Bible, but rather how Americans viewed themselves and ultimately, that came from how they viewed God should present His message. Our individualism made it possible. Reading this book for me was a quite eye-opening event and I made several several more highlights in my Kindle that could not be recorded. What are some lessons to get? First, we should all seek to go beyond the common sense interpretation of Scripture. We must really wrestle with Scripture and while I am not a presuppositionalist, that does not mean I do not recognize the importance of presuppositions. The assumptions that we bring to the text can affect the way that we read the text. Second, we must also get over ourselves majorly. All of us who want to learn the Scriptures need to realize that there is no shortcut to understanding. By all means pray before Bible study, but don’t pray expecting God to just beam the answers into your head. You’re going to have to do your part to learn the answers. Third, be extremely careful about signs. Some signs read would have pointed to the favor of slavery. Some would have pointed to the condemnation of it. It’s very difficult to judge God by current events, especially since you don’t know which ones are specifically from Him and which ones aren’t. We tend to view ourselves as really really special and therefore, God will treat us differently. Fourth, even opponents of Scripture need to learn to not be so simplistic. When we go by what the clear meaning is, we have to ask who that is clear to. Is what is clear to a modern Westerner the same as what is clear to an ancient Jew? The Bible was written for us, but we must not think that it was written to us. It is not all about us. Fifth, different interpretations does not mean that one is calling Scripture or inerrancy or anything like that into question. In fact, the ones who were opposed to slavery certainly did have a high view of Scripture. The fact that they weren’t using simple arguments was often seen as if it was a point to be used against them. Anyone interested in learning the importance of good interpretation in history and the problems with a rampant individualism need to take this book and see what it has to say.